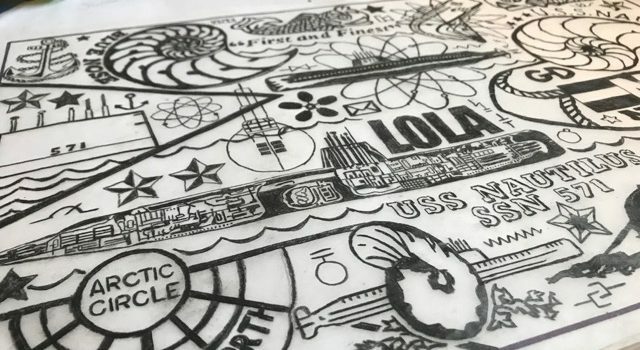 Jonpaul Smith is a Cincinnati artist known for his meticulous and tightly carved linocut blocks, as well as woven paper pieces. 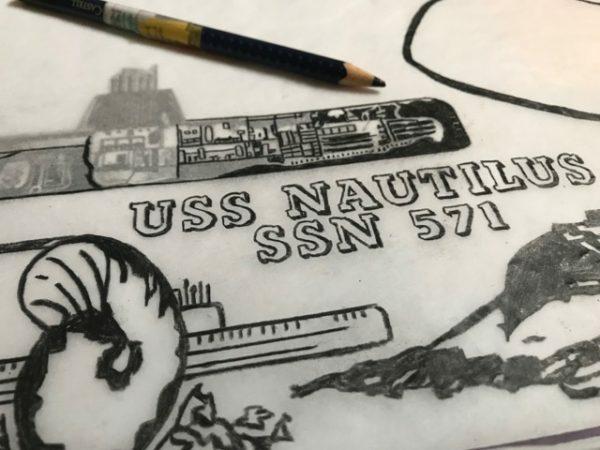 Recently, Jonpaul took on a collaborative project, becoming a visual interpreter for a Navy veteran’s story of service. 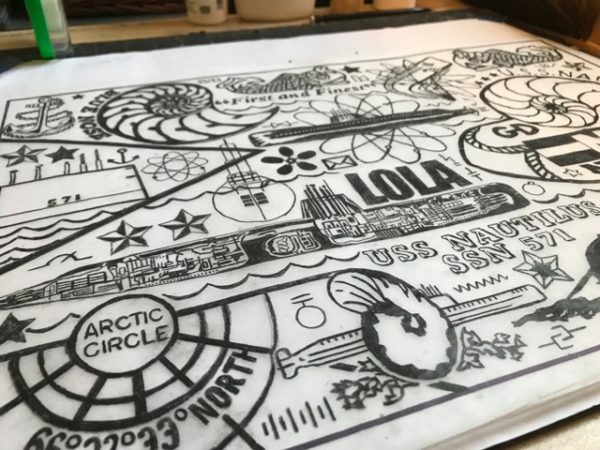 Inspired by an interview conducted by EVAC (Experiencing Veterans and Artists Collaborations) interviewer Julie Mayle recorded with Navy veteran James A. Morley, Smith composed a design for a linocut block which will be used to pull an edition of prints. James A. Morley was born in July of 1936. He served in the United States Navy from 1955 to 1959, a submariner aboard the USS Nautilus (SSN-571). Morley enlisted just after high school. In an interview transcript from 2015, Morley talks about everything from telling stories with his buddies (lunch and lies, he laughingly calls it), to submarine escape drills, to the dolphin pins that submariners receive when they qualify in all compartments (and how they’re promptly thrown over the side in celebration). The Nautilus was the first nuclear-powered submarine, eliminating a then-traditional need to surface often and recharge. 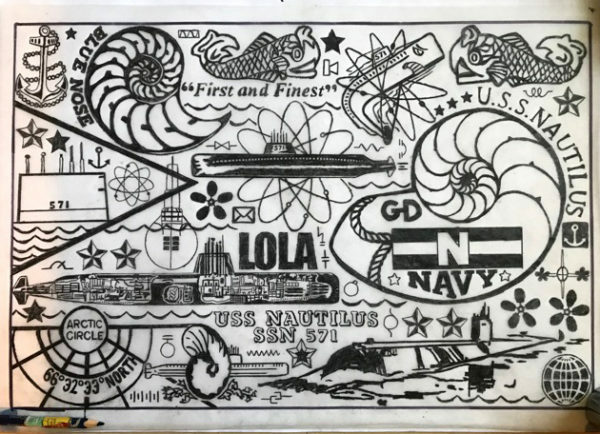 Morley worked as an Electrician’s Mate 2nd class on Lola (so nicknamed because “whatever Lola wants, Lola gets”—that submarine was the future of the Navy—what her crew needed, it received), spending most of his time on electrical systems like internal communications. He received an Order of the Blue Nose patch (awarded to “maritime personnel who’ve crossed the Arctic Circle”); the Nautilus was the first submarine to voyage under the Arctic polar ice pack). **to this day it remains on the Bars Leak company’s historical timeline: 1958.